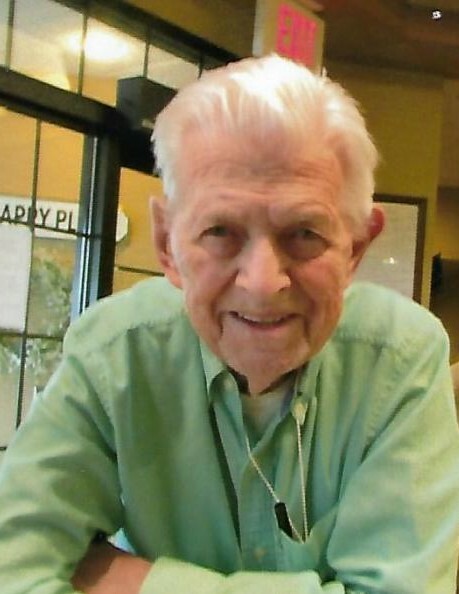 Dr. Edward “Ed’ Rink passed away on Friday, January 18, 2019 at the age of 93. Ed was born and raised, by Edward and Stella Rink, on Crystal St. in Humbolt Park, Chicago. The day he graduated from Crane Tech High School he enlisted in the Army. Ed was identified as academically talented and placed in the Army Specialized Training Program in Niagara Falls. WW2 was heating up and more infantry men were needed in Europe, so the program was shut down and Ed was sent on the USS Washington to begin his time in the 104th Infantry Division also known as the Timberwolf Night Fighters. Ed had the great honor of going on a Hero Flight to Washington D.C. a few years back. He was also featured as a Hometown Hero: Edward Rink wearegreenbay.com. Upon his return from the WW2 while working at AM Castle, Inc. in Chicago he met a young secretary named Loretta. Ed and Loretta married on June 5, 1948 and were married for 70 years. While Ed was the regimented soldier to Loretta’s free spirit, they shared quite a love for one another and created a large, beautiful family together. Ed worked many interesting part time jobs while putting himself through Loyola University and Loyola Dental School. The family enjoyed his many stories of being a waiter at the Conrad Hilton in Chicago, an attendant at Cook County Hospital and a wire inspector at Admiral Corporation. After getting his BS in biology/chemistry and with encouragement from his family dentist he went on to graduate from Loyola Dental School in 1955. Ed ran his own private practice in Niles, IL for 50 years and retired at the age of 80. He very much enjoyed hearing about the lives of his patients, their children and even took care of their grandchildren. Ed and Loretta had such fun with many of their close friends through the years particularly the “Dirty Dozen”. He looked forward to his Rotary meetings and enjoyed his weekly lunches with fellow colleagues. Ed had his pilot’s license, was an avid gardener and cook. His morning smoothies were legendary. Ed loved the goings on of his 11 grandchildren. He was so very proud of his kids and grandkids. Ed is survived by his loving wife, Loretta and three children: Gayle (Pete) Kindschuh, Ed (Sharon) Rink, Chris (Kristen) Rink; 11 grandchildren: Jeff (Salena) Kindschuh, Sarah (Nate) Kindschuh-Gill, Mary Kathleen Kindschuh, Hillary Kindschuh, Alexander Rink, Collin Rink, Stephanie Rink, Cameron Rink, Derek Rink, Nicholas Rink and Annie Rink; brother in law: Richard Rozycki whom he was friends with since the age of 12; niece/nephew: Laurie(Doug) Switzer, Rick Rozycki. Ed was preceded in death by his parents Edward and Stella Rink and sister Dorothy Rozycki.